SELLA CONTROLS, using its 40 years’ experience as a system integrator delivering safety critical control applications, has developed a solution that enables rail operators to centrally control all of its operational and retail telecommunication assets. Using proven ‘COTS’ software technologies, SELLA CONTROLS has designed a solution capable of providing a simple and effective common point of control via a fully integrated human computer interface (HCI). Utilizing industry proven SCADA software and hardware, SELLA CONTROLS has developed its ‘integrated Communication Management System’ (iCMS) toolset. Designed to meet the requirements of numerous applications, the solution is based on a client server architecture allowing multi user capability. System integrity is maintained by the use of a dual redundant RAID server architecture. The HCI user interface has been designed in line with well-known industry standards to provide a flexible and fully configurable application. This ensures that the final solution will meet the necessary human factors requirement of a modern operational control point. 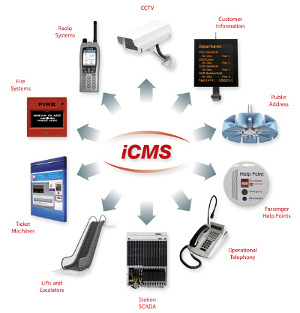 The iCMS solution has been developed with the use of industry proven software and hardware technologies. The iCMS application utilizes a ‘COTS’ software toolset, developed for a variety of industrial SCADA applications. Already in operation in the UK rail industry, the software product has been supplied for the integration of retail telecommunications assets. To enhance its solution for operational communications, SELLA CONTROLS has integrated its iCMS product with the DIKOS suite of rail telecommunication products. This provides effective control, routing and management of all operational telephony such as SPT, TT and PABX applications. The development of iCMS has been achieved by SELLA CONTROLS through utilization of proven market technologies, existing product partnerships and our experience in the delivery of integrated safety critical and control applications. Line control rooms or Service Control Centres (SCC) also feature several operational communication systems. Typically, a line controller may have four or five communications assets to manage as well as dealing with the safe operation of the signalling system. Quick, effective and correct operation of these assets is essential to providing a good safe service. For SCC applications, SELLA CONTROLS limits integration to the communication systems. Adapted to meet the requirements for the line management, SELLA CONTROLS utilizes its iCMS solution for the common point of control for all operational communication systems. The flexibility of the HCI design means that the iCMS solution, even though supplied as a separate system, can be engineered so that its appearance is similar or identical to that of the signalling system. This approach of commonality reduces the level of training required by personnel as mimic layouts, alarm and event regimes and menus are familiar. Typically rail stations and large transport interchanges are supplied with a variety of telecommunication systems. The approach from SELLA CONTROLS to this environment is to utilize its iCMS application to provide a single point of control for all existing and new communications infrastructure. Operators are presented with the direct control of station communications equipment via a touch screen HCI workstation. Simple station area maps are populated with active icons that respond to a strict alarm and event regime when an asset becomes active. These are controlled via dedicated operational menus for each sub system.